Will Sonic Be Hanging Out With The Competition After All? 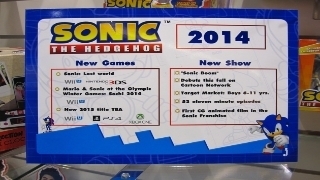 During last year's SEGA Direct Nintendo had announced that Sonic Lost World, Mario And Sonic: At The Sochi 2014 Winter Olympic Games, and one more unannounced Sonic title would all be Nintendo exclusive, however a new picture taken from the Nuremberg International Toy Fair "shown above" clearly shows that SEGA's upcoming Sonic title will be released on the Wii U, PS4, and XBox-One. So does this mean that SEGA is also pulling away from releasing games on Nintendo console's or at the very least is no longer going to work exclusively with Nintendo? We'll let you know more as new information becomes available. Re: Rumormill: Next Sonic Title No Longer Nintendo Exclusive?